I have long wondered about that. Why, for the love of God, are animals drawn to me?! Marc and I joined a few of our long-time friends for a trip to Pampanga last month. After a day in Fontana Leisure Park, we spent the remaining two days in Subic. My friends knew how much Marc and I love animals (luckily, theyâ€™re animal-lovers too), so they made it a point to stop by Zoobic, animal sanctuary / zoo. Two of our friends have already been there, but things turned out way differently during our trip. For starters, we stumbled upon a clan of monkeys by the road. Itâ€™s normal to see monkeys crossing or hanging out at the side of the road in Subic, but theyâ€™re usually just a family of four or five, not an entire clan. We saw an entire community of more than twenty monkeys by the road, so we stopped and took a closer look. They were pretty much oblivious to their human spectators, until the monkey leader started flashing his huge balls at us. Seriously, he did. After taking photos of the monkeyâ€™s balls family, we started to leave. But the monkey leader and his entire clan of subordinates followed our carâ€”we thought the swarm would jump inside the car and hitch a ride, so we hurried away. It didnâ€™t end there. 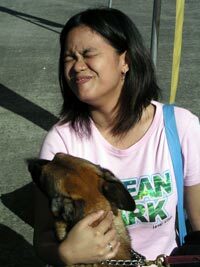 We stayed at Subic Housing, and there we met another swarm of animals. But this time, it was a horde of crows that wanted us to share our food with them. I didnâ€™t dare look at the snakes in Zoobic (I have an irrational fear of them), but it was still pretty eventful, if I do say so myself. 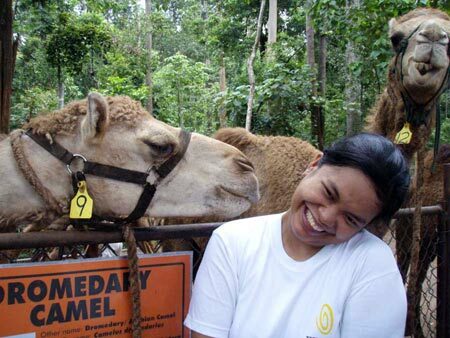 One of the ostriches gave a playful peck, the lazy fat pot-bellied pig followed us around, and that darned camel gave me a slobbery kiss on my face when I had my picture with it! But thatâ€™s not the worse. Our guide warned us that sometimes the tigers would try to make the visitors their â€œpropertyâ€ by spraying pee on them. When a tiger turned its back on you, you duck. It doesnâ€™t happen often, he said. Yeah right. Two, and I do mean two, tigers tried to pee on me. I was more than unnerved when I reached the exit of the Tiger place. I was loudly complaining to my friends that the tigers thought I looked like a toilet (what were the chances that youâ€™d get peed on twice while everyone walked by pee-free?! ), and the guide heard me. He was amused, and told me I should be flattered because it never happened before and the tigers were probably attracted to me. Ugh. This was a first, really. Iâ€™ve been used to having dogs go nuts whenever I pet them, Iâ€™ve had bomb-sniffing dogs turn into uncivilized pups (which handlers tried so hard to control) and heard countless of apologies from owners whose dogs have tried to hump my leg or kiss my foot at pet-friendly malls. But Iâ€™ve never had wild animals do those things to me. I donâ€™t really know why this happens. Maybe they know I love their kind and I lived in a house full of dogs, hamsters, and fishes? Itâ€™s strangely flattering, but itâ€™s still, strange. This entry was posted on Tuesday, 11 September 2007 at 4:26 am and is filed under Musings, Travel. LOL that’s beautiful. The animals know you are in tune and have compassion for all God’s creatures. Haha how cute. Don’t you feel flattered that they love to snuggle close to you. I think animals (especially pets) are good for our health. Ok ah~ Animal appeal. 🙂 Those a cute admirers you have. awww awesome! Take care, Gail. I love you blog, I think animals can sense whenever a Human likes them or not. The can also sense whenever we are down or happy. Thanks for sharing this blog, take care.